Encrypts and password-protects your data, providing a single, secure place to store your sensitive information. Tenebril's Personal Data Vault (PDV) acts as a safe-deposit box for your confidential documents. A vault encrypts and password-protects your data, providing a single, secure place to store your sensitive information. The PDV shreds deleted files to Department of Defense standards to ensure that they are destroyed beyond recovery. A variety of strength levels allow you to delete files using quick wipes or to perform wipes with the most advanced cryptographic algorithms available. 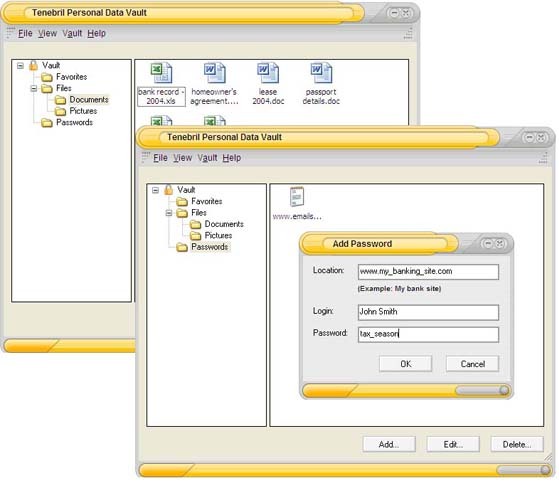 The Personal Data Vault protects your data from loss by performing manual or automatic backups and supports a wide array of media (CD ROMs, DVDs, removable disks and more); data in backup copies is encrypted at the same level of security as the original file. The Passwords folder keeps an organized list of Web sites, login info and passwords in one encrypted location. An automation section guarantees that you never leave your vault open, and another option assures that you only have one copy of a confidential document by securely deleting a file from your computer once it is dragged into your vault. 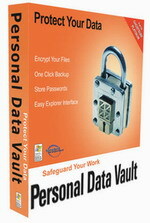 The Personal Data Vault even enables you to edit files from within the vault for maximum convenience. Shreds deleted files to Department of Defense standards to ensure that they are destroyed beyond recovery. Allows you to back up data at the same level of security as the original file. Supports CD-ROMs, removable disks, USB pen drives and more. Guarantees that you only have one copy of a confidential document by securely deleting a file from your computer once it is dragged into your vault. Auto-closes after a set time so that your vault is never left open or vulnerable. Keeps an organized list of online passwords, login info and Web sites in one encrypted location. Enables you to edit files from within the vault for maximum convenience.